Highly detailed small artwork of the ‘’57 Chevrolet’ badge script emblem as presented in chromium appearance with white outlines on the front left side of chest. 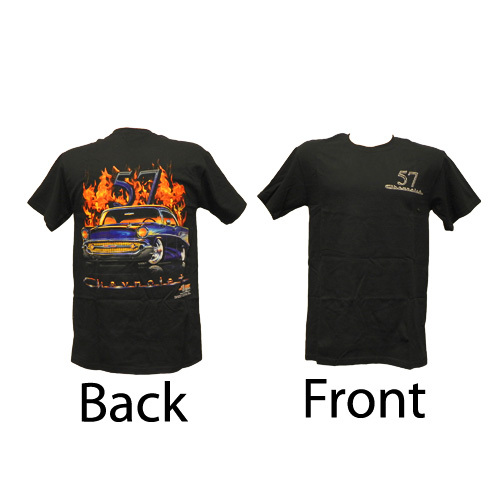 Note, there is no artwork of the shown vehicle on the front of the Tee. The fantastic main artwork showcases the attention to detail of this artists “air-brushed” impression of the 1957 Chevrolet Bel-Air two door hard top sport coupe. This brilliant artwork showcases the classic muscularity in design given to these big and heavy classic muscle cars of the late 50’s. Much emphasis is placed on the front end detail such as the big heavy Bumper Bar, the turn signal indicators and the classic chrome grille trim with the unmistakable Chevrolet Badge emblem in the centre. The brilliant chrome ornaments on the hood finish the front beautifully. The headlights are alive with fire, the exterior chrome trim is beautiful and scaled correctly, and that unmistakable rear tail fins and bright trim work is a masterpiece. The high shine duco that the body presents is flawless. This very neat cruiser has the right low stance with the big Billet style wheels with those awesome ‘knock-offs’ and white walls on low profile tyres. Again, the colours of this artwork are brilliant, with deep shine and reflection displayed within the body of this heavy Chevy, giving that three dimensional appearance. Initially, General Motors executives wanted an entirely new car for 1957, but production delays necessitated the 1955–56 design for one more year. Ed Cole, chief engineer for Chevrolet, dictated a series of changes that significantly increased the cost of the car. These changes included a new dashboard, sealed cowl, and the relocation of air ducts to the headlight pods, which resulted in the distinctive chrome headlight that helped make the '57 Chevy a classic. Fourteen-inch wheels replaced the fifteen-inch wheels from previous years to give the car a lower stance, and a wide grille was used to give the car a wider look from the front. The now famous '57 Chevy tailfins were designed to duplicate the wide look in the rear. Bel Air models were given gold trim: the grille, front fender chevrons, hood, and trunk script were all rendered in anodized gold. The 1957 Chevys did not have a oil pressure gauge or a voltmeter. The base engine was an inline 6-cylinder called the Blue Flame Six. The engine was smooth running and more fuel-efficient than the V-8. Carburetion came from a single one-barrel carburetor. Body choices for 1957 included 2- and 4-door sedans (identified by the "posts" between door windows), the two-door hardtop (also known as a sports coupé; the car has no post between the front and back window when the windows are lowered), the four-door hardtop (also known as a sports sedan), the utility coupé, a two-door sedan with a package shelf instead of a rear seat, the Delray "club coupe", which was a 210 model 2-door sedan, two styles of two-door station wagon, the top-of-the-line Bel Air Nomad with a sloped pillar behind the hardtop door and sliding windows at the rear seat, and the basic Handyman with an upright sedan B-pillar and a C-pillar, where the four-door wagons have one, available only in 150 and 210 trims. The four-door, six-passenger station wagon, the four-door, nine-passenger station wagon (both called Townsman in the 150 series and Beauville for the Bel Air version), and the convertible. Unlike most competitors, the Chevrolet 4-door hardtop featured a reinforced rear roof structure that gave the car added rigidity and a unique appearance in silhouette. The 1957 Chevy was called by some a "Baby Cadillac", because of many similar styling cues to Cadillacs of the time. Although not a production model, the 2-door wagon could be had with Bel Air trim (not Nomad). The background of the Tee illustrates ‘57’ script detail, in chromium style font within the fames of the artwork. The background artwork is of ‘life like’ bright orange and red flames surrounding the artwork, finished off with the ‘Chevrolet’ badge script in true factory detail. Tee shirt Colour: Available in Black only with Genuine GM Official merchandise Tag.